Established in 1893 by H.D. Hildreth, Hildreth Livestock Ranch is one of Montana's oldest continuously owned and operated working ranches. Hildreth Ranch sits in the beautiful Medicine Lodge Valley on the Montana-Idaho border in extreme southwestern Montana. 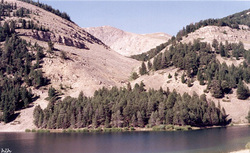 The valley was named by the Tendoy/Lemhi Indians, which summered on the ranch and in the area until the 1930's. Visit the great outdoors at the Hildreth Ranch for a getaway into real Rocky Mountain pristine Montana country. Explore the mountainous territories by hiking, cycling or driving, including the Continental Divide Trail for an actual nine continuous miles. Fish the mountain lakes and streams or the ranch's own stocked ponds with the sounds of prairie grass being blown by the breeze and the splashing of fish coming to the surface. Tour Lewis and Clark's expedition route. Explore old homesteads and ghost towns. Gain your thirst for geological knowledge. Stand at 9500 feet, with one leg in Montana where the water goes to the Atlantic and the other leg in Idaho, where the water goes to the Pacific, while enjoying panoramic vistas and abundant wildlife, accessible out our front door via hiking, biking or driving. .Visit the great outdoors at the Hildreth Ranch for a getaway into real Rocky Mountain pristine Montana country. Explore the mountainous territories by hiking, cycling, or driving, including the Continental Divide Trail for an actual nine continuous miles. Fish the mountain lakes and streams or the ranch's own stocked ponds. Tour Lewis and Clark's expedition route. Explore old homesteads and ghost towns. Gain your thirst for geological knowledge. Stand at 9500 feet, with one leg in Montana where the water goes to the Atlantic and the other leg in Idaho where the water goes to the Pacific, while enjoying panoramic vistas and abundant wildlife, accessible out our from door via hiking, biking or driving. Where else can you find everything that the outdoors had to offer by stepping out the door' Deer, elk, antelope, moose, song birds, sandhill cranes, eagles, hawks and many other animals to be seen in a pleasant atmosphere. There are no rattlesnakes or dogs to hamper your enjoyment. No highways with busy motorists zooming by, no urban developments to dull the experience of tranquility. Nights with sounds of animals serenading rather than vehicles driving. Twinkling stars like most have rarely perceived. The mountain air so refreshing that you want to bottle it up and take it home. You can visualize what it was like over a 100 years ago as the stage coaches journeyed through the valley on the Corrine Trail to the bustling town of Bannack. We are 50 miles southwest of Dillon, Montana, and are the last of four ranches in this valley, stretching 30 miles in length and reaching farther into the mountains. This is the highest elevation home-based, year-round livestock ranch in Montana, with our valley fields staring at over 7,200 feet and the mountain peak where our cattle graze reaching 10,000 feet in elevation. The ranch houses sit at 7,500 feet. .From Idaho Falls take interstate 15 North into Montana. Take Exit 44 at the Clark Canyon Dam, at top of off ramp turn left and cross the dam. Drive for 7 miles and turn left,at mile marker 8, on to the Medicine Lodge Creek road for approximately 23 miles until you come to a large sign that says Hildreth Livestock Guest Ranch, where the road turns into a Y. Take the road that goes to the left for 1 mile until you come to the ranch.